Ila Agler, age 91, of Spencer, Iowa formerly of Marathon, Iowa died on Wednesday, November 21, 2018 at the St. Luke Lutheran Home in Spencer. Funeral services will be held on Wednesday, November 28, 2018 at 1:30 p.m. at the Grace Lutheran Church in Marathon. Burial will be in the Poland Township Cemetery in Marathon. Visitation will take place one hour prior to the service at the church. In lieu of flowers, memorials may be given in Ila's memory to Alzheimer's Research, Hospice, or a Charity of your choice. The Sliefert Funeral Home in Albert City is in charge of the arrangements. Ila L. Josephson, the daughter of Gust and Media (Blomgren) Josephson was born at home on a farm near Albert City, Iowa. She was the third of six children. Ila was baptized and confirmed at the Ljunghed Lutheran Church at Albert City. She began her education at the Albert City Community School through the 11th grade and then transferred to Marathon where she graduated from the Marathon Consolidated School with the Class of 1945. On October 12, 1946, Ila was united in marriage to Charles “Buck” Agler at the Zion Lutheran Church of rural Storm Lake, Iowa, and this couple was blessed with two children: Larry and Diane. Ila worked as a teller at the Marathon bank from 1960 until 1978. She was then employed at the Marathon Farmers Coop from 1978 until 1989 but continued to fill in at the Coop until 1995. Ila was active in the Marathon community where she helped with the “Marathon to Marathon” for several years, was a Cub Scout Den Mother, a Girl’s 4-H Club leader, and belonged to the Tuesday Study Club, a 500 Card Club and the Happy 8 Club. 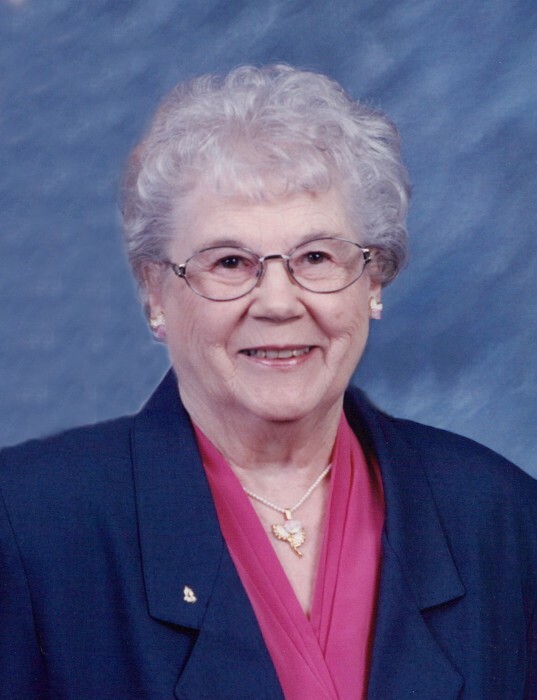 She was a faithful member of the Grace Lutheran Church at Marathon where she had been a Sunday School teacher, Bible School teacher, served on the Church Council and was active in all of the ladies church organizations. Ila enjoyed playing cards, sewing, reading books, and attending her grandchildren’s activities. Ila’s life is honored and cherished by her family which include her children: Larry (Sandy) Agler of Sorento, Illinois and Diane Rettig of Spencer, Iowa, her grandchildren: Shawn Rettig (Jodi) of Spencer, Iowa, Chris (Jane) Rettig of Ames, Iowa, , Missy (Matt) Loyet of Highland, Illinois, and Troy (Rebecca) Robertson of Highland, Illinois, her great grandchildren: Theron Rettig, Dakota Rettig, Lily Rettig, Autumn Rettig, Andrew Loyet, Cameron Loyet, Kaden Loyet, Lainie Elise Loyet, Dune Robertson, Zane Robertson, Mazzy Robertson, four great great grandchildren: Aris Rettig, Kayven Rettig, Noah Rettig, and Fenyx Rettig, a sister: Delores Christianson of Knob Noster, Missouri, a sister-in-law: Nola Josephson of Albert City, Iowa, numerous nieces, nephews, other extended family and friends. She was preceded in death by her parents, her husband of 65 years, Charles “Buck” Agler on March 16, 2012, her sisters: Ilon (Luther) Schmidt and Arlene (Lester) Pautsch, her brothers: Robert Josephson and Lloyd Josephson, her brothers-in-law: Dean “Chris” Christianson and Ronald (Irene) Agler, and sister-in-law: Mildred (Don) Cox. Memorials may be given in Ila’s memory to Alzheimer’s Research, Hospice, or a Charity of your choice.